Delay has no affect, If I.O. is not categorically asked about the reasons of delay. Delay has no affect, If the reasons of delay are fully explained. When more details of incident are elicited by the Investigating Officer during supplementary statement, it has full legal value. One chain of facts not mentioned in the statement, If the evidence is otherwise trustworthy, such omission cannot become basis for discarding the whole version. Non-mentioning of – which blow was given by which accused—is no ground to discard the evidence of the witness. There may be a delay in recording the statement of a witness. If the delay is genuine, it will not affect the creditability of the evidence of the witness. On the other hand, if it is unexplainable, it damages the prosecution case. a) If I.O. is not categorically asked about the reasons of delay. It was a case of murder. The Trial Court convicted the accused, but the High Court set aside the judgment of conviction. Feeling aggrieved, the State filed an appeal in the Hon’ble Supreme Court. One of the grounds of acquittal, as mentioned by the High Court was that statements of two material witnesses (PW3 and PW5) were recorded after a long passage of time. Therefore, their versions were unacceptable and improbable. One contention of the State Counsel was that no specific question was put to the Investigating Officer regarding such delay. Second submission was that delay in recording the statements of such witnesses was fully explained. Therefore, it has no affect on the creditability of the depositions of the witnesses. Putting of Specific questions to the Investigating Officer regarding the delayed examination is must. If the delay is fully explained, it has no affect upon the creditability of the witness. a) When witness suffered injuries in the region of his mouth and remained unfit to make the statement. b) When witness remained confined to his house due to tremendous fear from the accused party. It was a case of murder. The statements of two witnesses were recorded after some days. One witness suffered injuries on his face and in the region of his mouth. Due to these injuries he was not in a position to speak. The second witness remained under tremendous fear from the accused party and hided himself in the house of his in-laws. The Trial Court convicted four, out of the six accused for the offences U/Ss 302/49 IPC. The High Court confirmed the judgement and conviction. Feeling aggrieved the accused filed appeals in the Hon’ble Supreme Court. One contention of the accused was that there was considerable delay in recording the statements of witnesses. Therefore, their evidence should not be accepted. When delay in recording the statements of witnesses is fully explained, whether it affects the creditability of the evidence? It was a case of murder. The first Investigating Officer was not conducting the investigation impartially. He was transferred. The Statements were recorded by the new Investigating Officer. Due to this reason, the statements were recorded after 4-5 days of the occurrence. The Trial Court convicted the accused U/s 302/149 IPC. The High Court confirmed the judgment and the conviction. Convicted accused filed appeals in the Hon’ble Supreme Court. One contention of the accused was that witnesses were examined by the police after 5- 6 days of the incident. No satisfactory explanation for the delay was put forward by the prosecution. Therefore, their statements become unreliable. The Hon’ble Supreme Court held that if the delay in recording the statements of the witnesses is duly explained, it has no affect upon the creditability of the evidence of such witnesses. It was further held that in the present case, the delay is fully explained. In the night between 20th October 1988 and 21st October 1988 the sons of Eknath, Sanjay and Manohar, were sleeping in room No. 7 along with their friends Rajesh, Harshad Patel and Romi Antoni. At about 3.45 a.m. on that night, those boys woke up on hearing noise of the window and saw something cold falling on their beds. Accused were seen by these boys outside the room near the window while the said accused were pouring petrol into the room through the window. The accused persons thereafter set that room on fire by throwing ignated match stick into the room. The said room was locked by the accused persons from outside with a view that no one could come out. In this incident three persons died due to burn injuries and two received severe burn injuries. During investigation one rickshaw driver Vilas Shankar Shindey came to the police after seven days and got his statement recorded. As per his statement on the day of occurrence two accused hired his rickshaw. In that rickshaw they carried tins to the petrol pump and brought back the said tins filled with petrol. The Trial Court convicted the accused U/s 302/149 IPC. One contention of the accused was that statement of said witness was recorded after seven days of the incident and therefore, has no evidentiary value. The Hon’ble High Court held that the explanation of the witness was that till he read about the occurrence in the newspaper, he was not suspecting anything what happened on the night in question. This explanation fully justifies the delay. Therefore, it has no affect on the creditability of the evidence of the witness. Para “13. So far as the circumstantial evidence brought on record particularly the evidence of the rickshaw driver Vilas Shankar Shinde (P.W. 10) is concerned, his evidence that his rickshaw was hired by accused No. 1 and accused No. 6, in that rickshaw they carried tins to the petrol pump and brought back the said tins filled with petrol and went to a particular place, cannot be discarded simply on the ground that he has come forward for giving statement after seven days. This witness has also categorically stated that he read in the newspaper about the incident and he remembered about the passengers who hired his rickshaw on the particular day of the incident and who had taken his rickshaw to the petrol pump and from where they had taken petrol and returned back to a particular place where they got down from the rickshaw. There is no reason for this witness to falsely involve these accused persons because there is no evidence showing any enmity between accused No. 1 and this witness. The reason for not coming to the police station immediately need not be explained and that will not discredit his evidence in view of the other circumstances. Until he read in the newspaper, he did not suspect anything happened on the night in question. Immediately after reading the news item, he has voluntarily gone to the police station and given his statement. Therefore, the submission of Mr. Mundargi is unsustainable. i) One chain of facts not mentioned in the statement, If the evidence is otherwise trustworthy, such omission cannot become basis for discarding the whole version. Alamgir, the accused was resident of Pakistan. He was married to Ms. Hazra (known by the name of Halima after marriage). On 17th September, 1991, the accused came to Delhi along with his wife Hazra alias Halima. On 18th September, 1991 at about 8.50 p.m., they checked-in in a hotel at Darya Ganj (Royal Inn Guest House). After registration in the guest registration book, the accused and his wife, who was in Burqa, were allotted Room No. 107 and the key was handed over to Alamgir. On 19th September, 1991, Alamgir, however, went out and brought some breakfast and at or about 10.15 in the morning, he reported at the counter informing therewith that his wife being left alone in the hotel room ought not to be disturbed and that he would be back soon. Alamgir, however, did not return till 20th and the Manager of the hotel by reason of not being able to get any response from the room after several attempts, opened the room with the duplicate key in the presence of one Dinesh Chand and found that the deceased was lying on the bed covered with a red dupatta. Immediately thereafter, the police was informed. FIR was registered. During investigation, statement of Shamim Bano, sister of deceased was recorded. As per her statement accused Alamgir had given a telephonic call to her at Bombay from Delhi and asked her to call his father who had come from Pakistan. But his father was not available in the house. Alamgir also told that Hazra had died in bus accident. Shamim Bano told all these facts to the police after three-four days at Bombay. The accused was arrested. After completion of investigation the charge-sheet was filed in the Court. The Trial Court convicted the accused for the offence of murder and sentenced him to undergo imprisonment for life. This judgment was confirmed by the High Court. Feeling aggrieved, accused filed an appeal in the Hon’ble Supreme Court. One contention of the accused was that in the statement of Shamim Bano recorded U/s 161 Cr.P.C., the fact as to the date of departure of the accused with his wife Hazra alias Halima from Bombay to Delhi and the subsequent telephonic message that Halima died in a bus accident and that cremation has taken place in Nizamuddin has not been mentioned. In the absence of these facts, the whole evidence of the said witness becomes doubtful. Whether non-recording of one chain of facts in the statement of a witness, makes the whole evidence untrustworthy? The Hon’ble Supreme Court held that if the statement of a witness is otherwise cogent and reliable, mere missing of one chain of facts in the statement recorded U/s 161 Cr.P.C. does not render the whole evidence as untrustworthy. Para “13. The circumstances noticed above, if read with the evidence of PW6, Shamim Bano as to the date of departure of the accused with his wife Hazra alias Halima from Bombay to Delhi and the telephonic message after two days that Halima had died in a bus accident and that she had been cremated at a cremation ground in Nizamuddin this piece of evidence, as noticed above, if read along with the circumstances noticed above, would form a chain without there being any snap. Strenuous submissions have been made as regards the admissibility of the Handwritng Expert’s opinion as also a challenge thrown to the non-admissibility of the entire evidence of Shamim Bano, PW-6. This evidence of Shamim Bano has been challenged on two counts: on the first Shamim Bano, being the sister of Halima, was an interested witness and secondly, she did not say so in a statement before the police under Section 161, Cr.P.C. 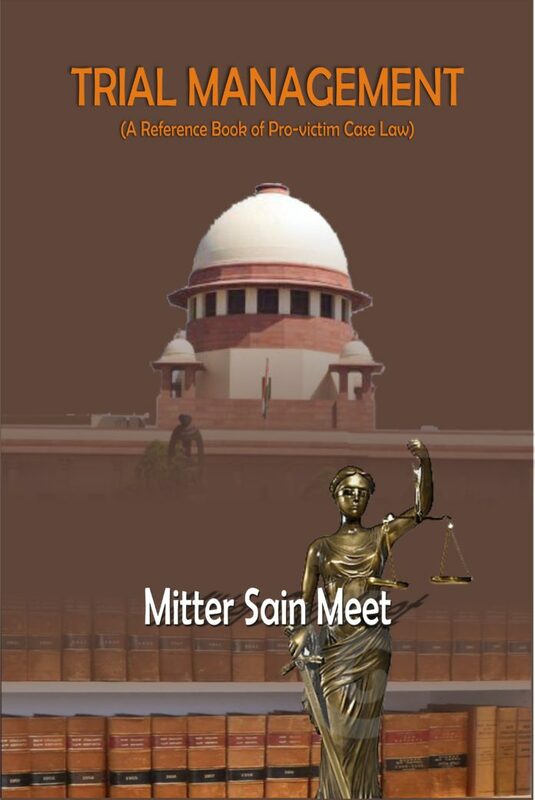 ii) Non-mentioning of – which blow was given by which accused—is no ground to discard the evidence of the witness. It was a case of murder. There were three eye-witnesses to the occurrence. The number of accused was four. The eye-witnesses stated that appellant/accused gave a ‘barshha’ blow to deceased Mann Singh on his chest which proved to be fatal. The Trial Court convicted the appellant/accused and acquitted the other three accused. The High Court confirmed the judgment of the Trial Court. One contention of the accused was that the three eye-witnesses had not specifically stated before the police, when their statements were recorded under Section 161 Cr.P.C. that Amrik Singh had given the fatal blow to the deceased. Therefore, on the basis of their statements, it cannot be held that appellant/accused was the murderer. Whether non-mentioning of the details of the injuries caused by the accused to the deceased makes the whole evidence as unreliable? The Hon’ble Supreme Court held that non-mentioning of specific reference of injuries caused by the accused to the deceased, does not make the evidence as unbelievable. Supplementary/subsequent statement of a witness and its evidentiary value – FIR lodged by informant. If on subsequent interrogation police eliciting more details of occurrence from him, his evidence could not be thrown overboard on that ground. On 23.10.1986, at about 1.30 p.m. Jasbir Singh and Harpal Singh who were studying in the first semeter of M.A. (English) – and Randeep Rana (who was the Secretary of the students Union to which Jasbir Singh belonged) were standing outside the canteen of Nar Hari Hostel. Suddenly Himat (A-9) caught hold of Jasbir Singh and then Satparkash (A-6) slapped a knife blow on the left chest of Jasbir Singh which was followed by Satbir Singh (A-1) inflicting another knife blow on the left side of his chest. When Sumer Singh (P.W. 6) intervened, presumably to rescue his colleague, he was prevented from nearing the victim by Jeevan Singh (A-8) and Sandhip Singh (A-10). But right at that time Devinder Singh (A-5) gave a stab injury on Sumer Singh on his front costal margin. The other assailants also attacked the deceased with iron rods, clubs and hockey sticks etc. Jasbir Singh breathed his last very soon, but Sumer Singh did not die as he was operated upon emergently at the Post-Graduate Institute of Medical Education, Chandigarh which saved his life. FIR was registered at the statement of Harpal Singh. Accused were arrested. After completion of investigation the charge-sheet was filed in the Court. During trial, Harpal Singh was examined as PW3 and Sumel Singh as PW6, alongwith other witnesses. The Trial Court disbelieved the versions of the eye-witnesses and acquitted all the accused. Feeling aggrieved, the State and Harpal Singh filed appeals in the Hon’ble Supreme Court. One of the grounds of acquittal was that when the Investigating Officer interrogated PW Harpal Singh subsequently, he gave more detail regarding the occurrence. Such supplementary statement cannot be relied upon to convict the accused. Plea of State/complainant Counsel was that supplementary statements eliciting further details cannot be suspected on flimsy grounds. Whether supplementary statement eliciting more details of occurrence makes whole evidence of the witness untrustworthy?